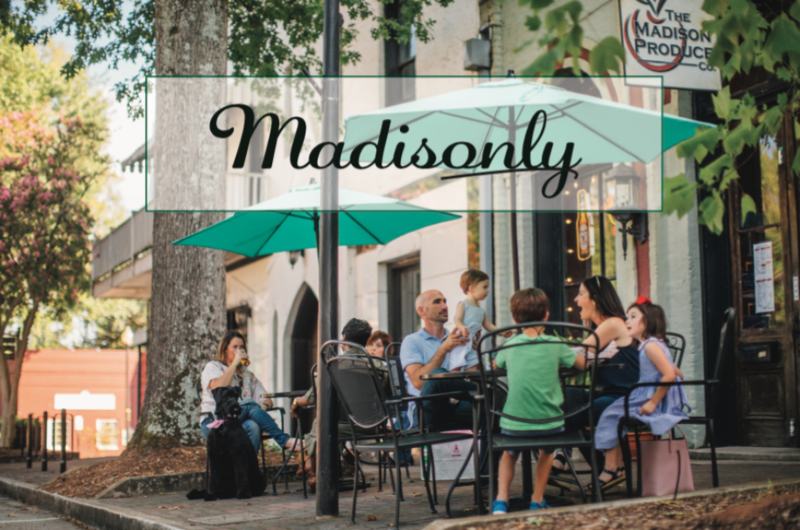 Learn more about Madison, GA here! The month of February often brings thoughts of love and romance to everyone’s minds. If you can’t decide what to give your special someone for Valentine’s Day, why not give the gift of quality time together experiencing and exploring a beautiful town? This year, your valentine (or girls group) needs more love than a predictable box of chocolates. Bring them to the town Trips to Discover named one of the 10 Best Romantic Getaways in Georgia: Madison! Just an hour east of Atlanta, our town is conveniently located close enough to escape for a weekend, but far enough away to offer a totally different pace of living that radiates hospitality and exudes romance at every turn. Here’s the good news: we’ve done the hard work for you and planned a perfect weekend itinerary sure to make your special someone feel loved (and impressed)! Read on for Madison’s weekend romantic getaway itinerary, and make sure to download the printable itinerary pdf. A boutique hotel nestled in the Historic District, the James Madison Inn offers an incredibly charming ambience and gorgeous rooms themed after historic homes in Madison. They currently have a romance package available that would make your special someone feel extra loved and pampered! There are several lodging options in Madison to choose from from charming B&Bs to hotels conveniently located to I-20; for more information about where to stay, visit our website here. The jazzy, low-key feel here easily makes Mint Juleps Kitchen one of the most romantic restaurants in Madison. Hang out in their gorgeous lounge area with a mint julep and enjoy an exquisite dinner with your love – but make sure to leave room for dessert! Everyone associates chocolate with Valentine’s Day, but skip the heart-shaped box and go for something more original. Make your loved one feel that much more special by stopping in Antique Sweets on Main Street and grabbing an assortment of locally handmade chocolates. A local favorite, it’s a great memento of your trip to Madison and how much they mean to you! Before you retire for the night, take a stroll through Madison Town Park just across the street from the Inn. Cooke Fountain illuminated by the gorgeous string lights across the walk will be the most picture-perfect setting you’ll visit all day! Farmview Market is one of our favorite places to enjoy breakfast. Nothing says “I love you” quite like their stuffed French toast! Just in case you need another reason to visit: Farmview’s cafe is serving up free coffee for the entire month of February! Don’t forget to spend some time browsing their regionally-sourced grocery beside the cafe. Tucked away in Morgan County’s bucolic countryside just 7 minutes from Downtown Madison, the Steffen Thomas Museum of Art is home to a truly remarkable collection of artwork created by Expressionist artist Steffen Thomas, spanning from bronze sculptures to larger-than-life paintings. This museum is an experience in itself as you find yourself wandering through the serene galleries exploring the artist’s life through his work and legacy. Plus, the love story of his marriage is better than anything you’ll read in a Nicholas Sparks book! Deemed One of America’s Best Dude Ranches by Travel + Leisure Magazine, Southern Cross Guest Ranch is just the place to escape to the country for horseback riding, delicious meals served 3 times a day, and ultimate tranquility. Book a horseback riding session for two for an experience your valentine will never forget. They also have an incredible Valentine’s Day package available! After sitting down for a delicious lunch at one of Madison’s restaurants, take some time to peruse through antique shops, specialty storefronts, and charming boutiques that Downtown Madison has to offer. For a great map of the downtown area with shops and restaurants labeled, check out our Visitor’s Guide online or pick one up at our Welcome Center (more info below). After a busy day of exploring Madison, what better way to relax than with a massage or facial? Pure Bliss Spa is conveniently located downtown and offers many amazing services sure to help you unwind before dinner. Town 220 Restaurant located just behind the James Madison Inn is a favorite local dining option for visitors and locals alike. The upscale elegance and impeccable menu will surely offer a meal you’ll both talk about for a long time! The best way to experience the charm of the Historic District and discover its countless stories from the 19th century is on foot with our free self-guided audio walking route app in hand! A 1.5 mile walk through town with stories of homes, churches, and other historically significant sites, you can take as much or as little time as you want exploring the tree-lined streets. You can download it for Apple here or Android here. Stop #1 is the Welcome Center, located on the corner of Main and Jefferson, where they can help you download the app and answer any other questions you have about the town. It’s also Madison’s public restrooms. Stop in here, grab a coffee from Perk Avenue across the street, and start your journey! The Madison Welcome Center is located at 115 E. Jefferson Street. Needless to say, love is always in the air in Madison! You can’t go wrong visiting us this V-Day or any time you’re in need of a romantic getaway.